We have ski lessons for all ages and abilities throughout the winter. Click any of the red tabs for more information on the ski lesson groups that we offer. To register online for any session, just click on any of the blue tab lesson programs and then click on the lesson dates that fit your schedule. Share the magic of skiing with your child and join our new Parents and Tots program. This one-hour class is offered for three consecutive Monday afternoons in January and in February, and is designed to introduce your child to the sport of skiing with their favorite teacher ... you! Of course, we will also have one of our professional instructors with the class to help guide you. One parent must accompany every tot and the parent should be at a blue level of skiing. Parents can either bring their own equipment or rent ours for $42 for the three lesson session. Is your four year old keen to follow their older siblings? Or are they already an expert at sliding and playing in snow and are ready to try out skiing? Our new Mighty Mite program may be just what you are looking for to introduce your 4 year old to skiing. Classes are on our easy-to-use carpet lift and are FUN for the little ones. Small class sizes (max. of 5 per instructor) will ensure that your child has individual attention and you are of course welcome to be close by if they need a little extra support. Introduce your 5 or 6 year old to skiing in a positive and FUN way! Small class sizes (max. of 6 per instructor) are designed to provide individual attention to your child. Each class is one hour long. The Mites class is for the 5 or 6 year old child just starting out while Meisters is for the more advanced 5 or 6 year old skier. Discover: If you've never skied before, then our Discover program is the one to start out with. This program is designed to introduce you to the sport of skiing, get comfortable with the equipment and get you up and down on our Bunny Hill and Porcupine Hill. Green: This level is offered for those who have skiied before but are still more comfortable on the Bunny Hill. By the end of the class, each skier should be able to ski unassisted on our Bunny Hill and Porcupine Hill, and will be introduced to the chairlift. Blue: In the blue level, we perfect the snowplow turn and introduce you to the basic parallel turn. Black: In this level, our instructors will assist you in improving your parallel turns including: balance, pivoting feet, edge control and linked turns. We offer a three day group lesson package for all levels or a one day group lesson for the Discover Level. Join us for our 55 or better ski lesson program. Lessons are offered from 1:30pm to 3pm for three Tuesdays in January or February. All abilities are welcome! Weekend ski lessons are offered every Saturday or Sunday for three weeks with classes available in the morning or afternoon. Note that the session that was originally starting on Feb. 2 or 3 has changed to start on Feb. 16 or 17 due to the very cold temperatures in February. The session originally starting on Feb. 23 or 24 has changed to a two lesson program starting on Mar. 9 or 10. A spring weekend class is available for two weeks on Saturday or Sunday starting March 9 or 10 with classes available in the morning or afternoon. Weeknight ski lessons are offered on Tuesdays or Thursday for three weeks. If you've never skiied before and our three-day lesson program doesn't fit your schedule, you can choose to take a one-day Discover Level group lesson. Discover classes for Juniors or Youth/Adults are one-and-a-half hours (11:45am to 1:15pm) and are offered on Saturday and Sunday as well as through the holidays. Note that the lift ticket for this class is a Bunny Hill ticket only. While your children are in lessons, why not ski or ride for the day. 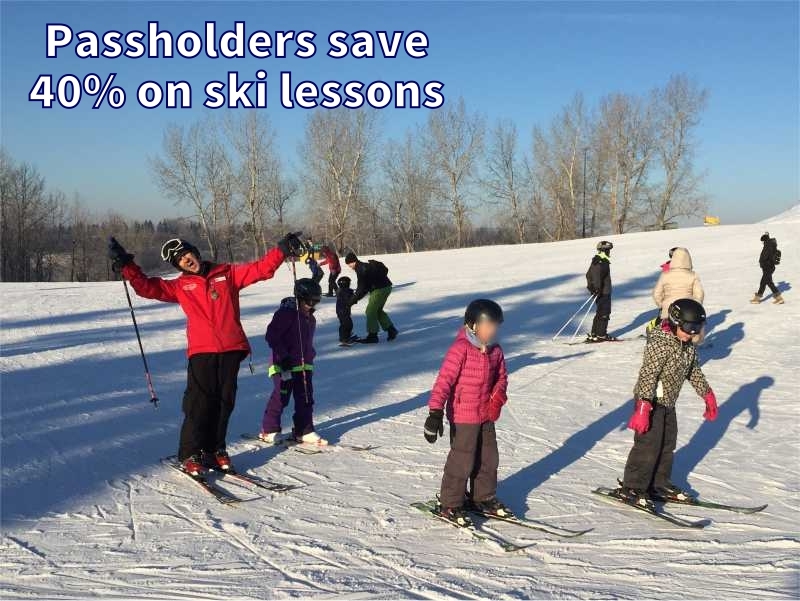 Take advantage of our parent ticket and rental price which makes it much more affordable to ski while your kids are in their class. Lift tickets are only $18 while ski or snowboard rentals are also only $18. And best of all, the lift ticket and rentals are good for the whole day and for all lifts. Pick yours up at reception when you get your kids lesson ticket. Note that parent tickets are for Mom and/or Dad only and not for other family members. If you have a family profile and are registering online, you no longer need to complete a rental form at the hill. Just be sure that when you create or update your profile, that you have correctly filled out the rental information for each person renting (height, weight, shoe size etc). To update your profile, first sign in, then click your name in the top right of the page and select the Edit profile option. When you arrive at the hill on the first day of classes, your rental form will be printed and you just have to sign it. Rentals include skis, boots, poles and a helmet. If you are registering over the phone and require rental equipment, then you must complete a rental form when you arrive at Sunridge on the first day of classes. Make-up classes are offered for our three-day camps if we cancel the class due to extreme cold weather or other adverse conditions. You may also take ONE make-up class if one class of our three day camps is missed due to illness or a scheduling conflict. These make-up classes are one hour long and are offered on Saturdays Jan. 12, Jan. 26, Feb. 16, Feb. 23, Mar. 2 and Mar. 9 from 3:15pm to 4:15pm. No other refunds or credits are given should a class be missed. Please pre-register for all ski and snowboard lesson programs either online or by calling us at 780-449-6555. If you are signed in, you may register online by just clicking on the lesson dates of your choice. Payment is required at the time of registration and can be made by cash, Interac or over the phone with your VISA or MASTERCARD, or online with PayPal. Note that you do not need a PayPal account to pay online with PayPal. All pre-paid lesson programs are non-refundable.